Burma Army transport trucks in Karen State, Burma. Jan. 2019. In June 2018, fighting broke out between the DKBA and Burma Army, displacing five villages (Nya P Tey Hta, Oo Moo Kee, Haw Htee Per, Tha Daw Jo Boh, Wah Bway Hta) comprised of 410 people. After fleeing, the internally displaced people (IDPs) settled near Oo Moo Htaa, on the river near the Thai-Burma border. In November 2018, a Ranger team went to investigate the situation and help the IDPs. As a makeshift camp, facilities are almost non-existent and the team reported that the villagers had no school for their children, no clinic, and are critically short of other basic facilities such as proper sanitation and toilets. The local KNLA battalion commander said that while he wanted to help the IDPs return home, he was unable to do so because of landmines around the villages and the surrounding area. With the anticipation of more fighting, the DKBA sees no point in clearing their landmines or letting the villagers return as they would just have to flee again. 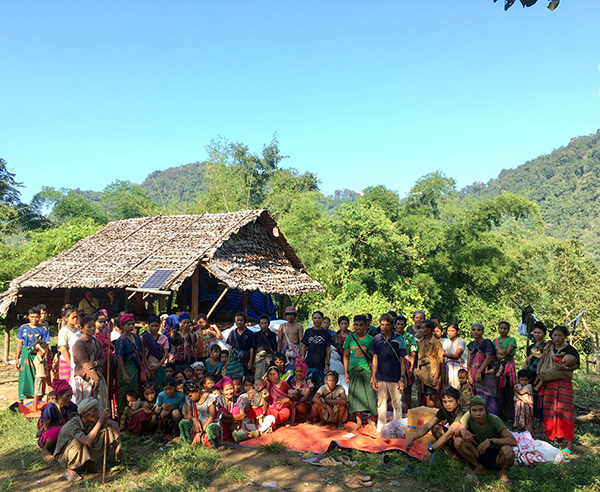 For three months, the Committee of Internally Displaced Karen People (CIDKP) provided help to the IDPs, but their funding is now exhausted and they are trying to find other organizations to assist them. While with the IDPs, the FBR team provided 70 50kg sacks of rice, sufficient to feed the IDPs for a month, as well as salt, chilies, and seasonings. Some of the Karen IDPs the team met with on mission. On 27 Oct. at 1900, Burma Army forces (unknown size) went back to the Wa Klay Tu (Ler Mu Plaw) area. On 2 Nov. at 1240, locals reported a Burma Army Air Force plane and helicopter in the Ler Mu Plaw and Phraw Gaw areas. On 3 Nov., Burma Army forces arrived in the Hsa Law Kyo (Kee Pu) area with uniforms and equipment, causing the villagers to worry about a potential outbreak of fighting. On 4 Nov., the Burma Army control of 90 or more soldiers returned to Kow Daw Koh from Hsa Law Kyo. On 14 Nov., Burma Army Infantry Battalion (IB) 60 was active in Di Law Koh, Yu Gaw Ni, and Doo Ko Low Klo before sending food and supplies to Doo Tall Kyo and occupying a security position there. At 10 a.m. on Nov. 25, the Burma Army base at Kow Daw Koh sent supplies to their base at Hsa Law Kyo. On 17 Nov. at 0740, the Burma Army shot at a villager in Di Law Koh (Ler Mu Plaw area) but did not hurt them. On 30 Nov. at 1400, the Burma Army dispatched drones to the Kee Pu area from their Hsa Lay Kyo army camp. The Burma Army still maintains a base camp for MOC 20/TOC 3 at Bu Sha Kee (Pu Doh Koh). Burma Army Light Infantry Battalion (LIB) 587 was present in Htee Toe Per; LIB 598 was present at Wa Thoo Hta (Ta Mae Hta) and Shaw Law Kyo (Kee Pu) base camp; and LIB 595 was active in security stations between Kor Daw Koh, Wa Thoo Hta, Sha Law Kyo, and Htee Toe Pu. On 2 Dec., Burma Army LIBs 596 and 599 provided security for the delivery of a JCB machine (D7) and an additional diesel fuel vehicle. 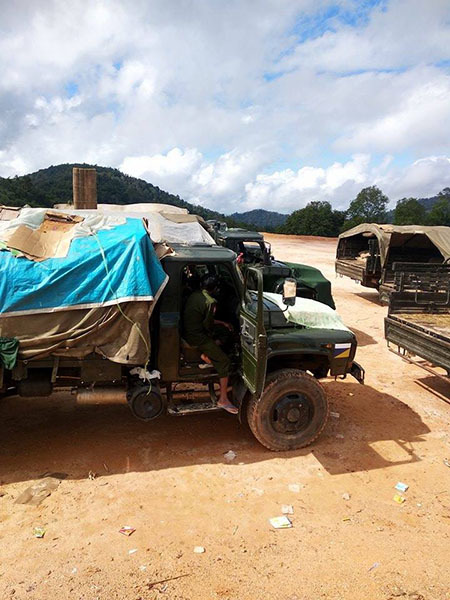 The vehicles stayed in Karen State’s 2nd Division and did not cross into the 5th Division. Additionally, Burma Army IB 48 arrived at Ta Koe Kyo, near Por Kay Koh. During a January 2019 mission in Karen State, Free Burma Ranger teams observed that the Burma Army had doubled troop size at their camps. 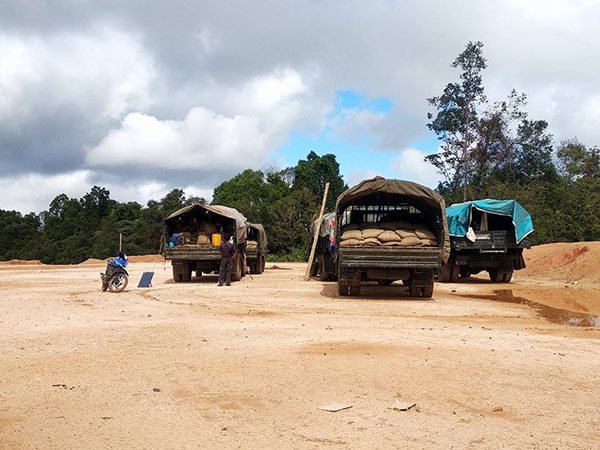 Other rangers reported Burma Army trucks on the move to increase supplies at Burma Army camps.